You can obtain additional reports about your phishing campaigns by clicking on the Reports tab under the Phishing section of your console. Read this tutorial, or watch our Monitoring Phishing Campaigns video, to learn more about this topic. 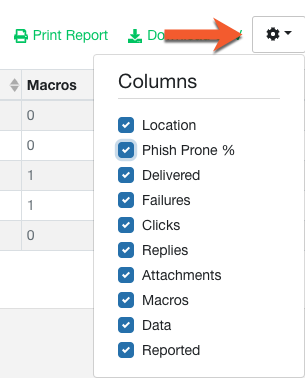 Using the drop-downs you can specify a specific date range for the report or limit the report to one or more phishing campaigns. You can also choose one or more groups from the Include Campaigns Sent To drop-down, to limit the report to only the phishing campaigns sent to the selected group(s). Comparison reports can be run by choosing either Failures or Reported from the Compare drop-down menu and then choosing what metric you want to compare the report by, such as user group, location, manager, etc. For example, you could compare failures by location to see which branches of your organization are the most phish-prone. NOTE: In order to compare by metrics such as location, manager, etc., you must have that data imported into your user details. User information can be added with a CSV import or by using our Active Directory Integration feature. 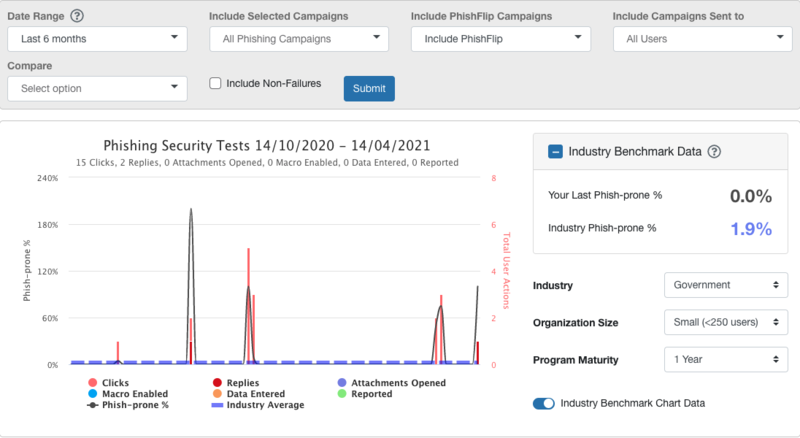 You can also run a comparison report for failures by email template, in order to see which types of phishing emails your users are most prone to clicking. In contrast, you could run a comparison report for reported by email template, in order to see which emails your users are identifying and reporting as phishing emails. NOTE: You must be using the Phish Alert add-in to be able to see any reported data. Underneath the pie graph, you can click on any metric in the graph key to remove it from the graph view (as shown below). Depending on the report metrics selected, a bar graph or pie chart will display. The report details will populate in a datasheet below the graphic. You can add or remove the columns you'd like displayed in the datasheet by selecting the gear icon drop-down button, selecting/deselecting the desired attributes, and clicking the Apply button, as shown below.